We’re excited to let you know about new programs and plans focused on the future of our theatre, theatre in our community and theatre across the country. One of our most exciting initiatives is our Indigenous Learning Exchange Program. Recognizing the scarcity of Indigenous administrators, stage managers, designers, and technicians, we are now providing paid opportunities for Indigenous colleagues to gain experience and develop skills that will enable them to step into these roles – in Indigenous and non-Indigenous theatres alike. With the guidance of Kristy Charlie, our new full-time Indigenous Cultural Advisor, we hope to ensure that we develop a two-way learning experience. We want to hold space for our Indigenous co-workers to share their culture with us, and we want Belfry staff to learn new ways of creating, communicating and being in the world. Another forward-looking addition to our operations is our Emerging Artist Enhancement Program. Our goal is to create paid opportunities for young designers and directors in our community to continue their training by assisting some of Canada’s most exciting and experienced artists. We launched this program this fall when Hilary Britton-Foster, a young local lighting designer, assisted Kevin Fraser, a lighting designer with 30 seasons at the Stratford Festival under his belt. Hilary and Kevin worked together on our production of A Doll’s House, Part 2. Caroline Moon will be the assistant projection designer on Griffin & Sabine, and at the end of the season, Aidan Dunsmuir, a nascent sound designer, will assist on 4000 Miles. Future plans also include professional training classes for actors in our community. 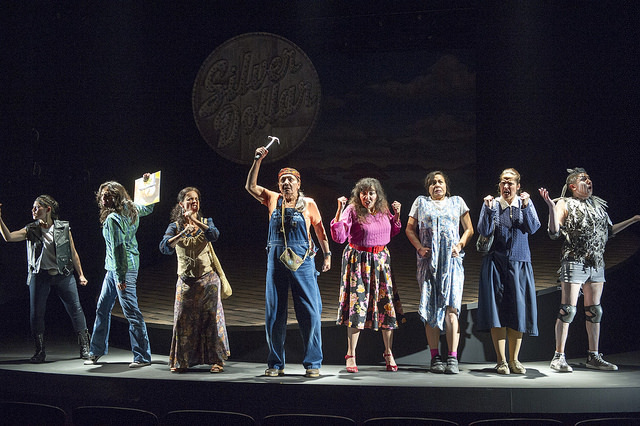 Our region lacks the artistic stimulation that exists in larger theatrical centres, where it is possible to engage with a large body of diverse artists. It can be difficult to continue growing creatively if one is always working with the same group of artists – no matter how talented. Our goal is to expand beyond the professional development workshops currently offered during the SPARK Festival, by adding advanced acting, voice and movement classes, as a kind of post-post secondary training opportunity. Finally, a long-term goal, whose time has almost arrived, is making better use of our Studio Theatre – another great place to see great theatre! We program this space during the SPARK Festival, but outside of that, we use it for other purposes. Without consistent programming, it is difficult to give the space vitality and an identity. Dedicating it for use solely as a theatre will allow us to program there, and also increase community access to this wonderful performance venue. We are writing to ask you to help support these exciting initiatives – initiatives that will have a lasting effect on the arts in our community, and the work that is created in theatres across Canada. We have managed to secure start-up funding for our Emerging Artist Enhancement and Indigenous Learning Exchange Programs, and now we need to help them grow strong roots and flourish! As one of this region’s leading arts organizations, we have a responsibility to contribute in ways that go beyond the excellence we produce onstage. We are stepping up to assist with training the next generation of theatre artists, including the Indigenous theatre artists who are going to help define the culture of our future and the face of Canadian theatre. 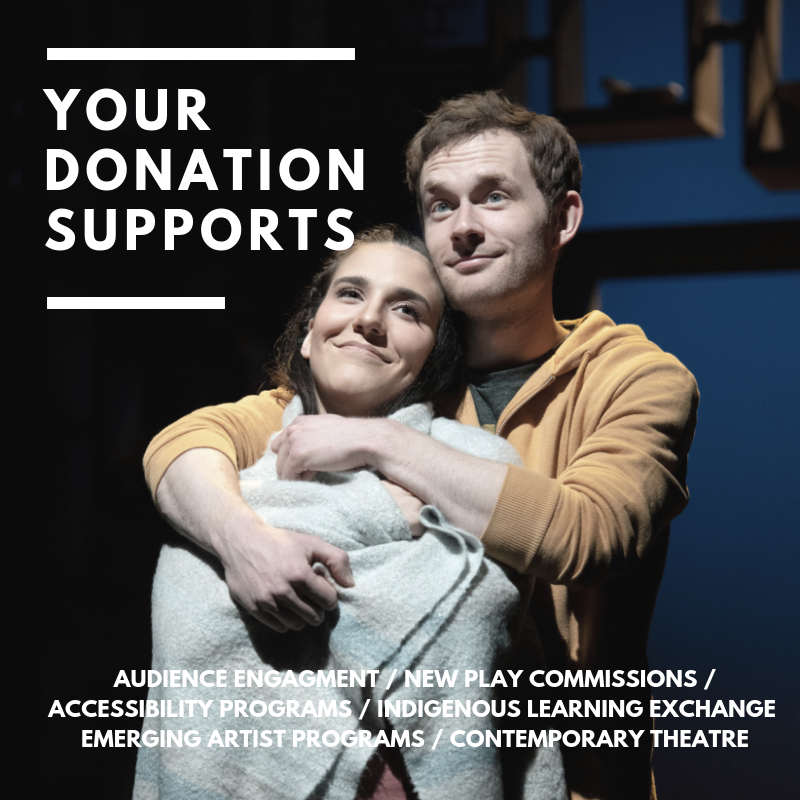 Your support will help us produce great theatre and fulfill some of the important and vital roles that go along with being an accountable and ethical player in our unique and remarkable community. P.S. Please remember to mail your donation or contribute online no later than December 31 if you wish to receive a tax receipt for the current tax year. If you prefer to donate by phone or in person, please do so by December 23.